It was an honor to attend the International Day for the Elimination of Violence against Women at the Asian Development Bank. I was also a guest at last year’s celebration of gender empowerment, and I was grateful to be there again to show my support for this worthy cause. 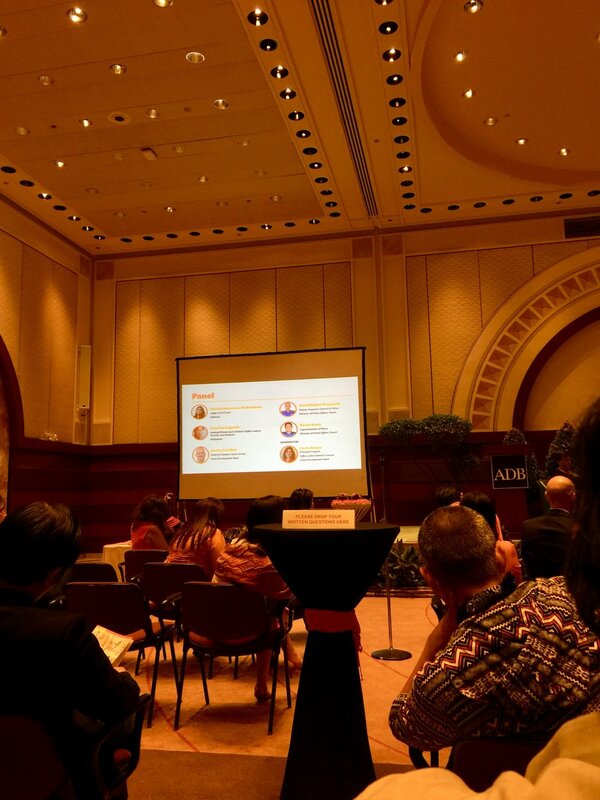 I am humbled to represent my blog, and to be able to be at ADB again. The bank inspires me with its strong stance to further the cause of gender equality. As a woman, I am proud to be a guest at an institution that recognizes my potential in society. It was a treat to see this year’s Christmas tree at the library. And no trip to ADB is complete without a cuppa from Starbucks! I was able to knit prior to the meeting. Then, I had lunch at the ADB Cafeteria. I bought pizza slices from Gourmet’s Cafe, which used to run the now-defunct Trattoria Gourmet’s at Shangri-la Mall. The crew from Shang were there, and they still remember me! It’s heartwarming that they still know me after all these years. Their pizzas brought me back to 1999! Still delicious. By the time the forum started, I was already full and caffeinated enough to listen to the esteemed panel speak about their work in fighting gender violence. The panel have all mentioned that shifting our mindset to be inclusive of all genders and to think of everyone equally is key to preventing gender violence. I am happy that I was able to make time for this forum because it has empowered me to speak out for women. I am using my blog not just to give myself a voice, but to motivate other women to leave their partners if they are abused. Together, we can build a safer society that is kind to all genders. It is my dream that I can continue empowering women in my own small way, with every blog entry and solo dining experience that I share!